Tuesday this week, four Americans, including U.S. 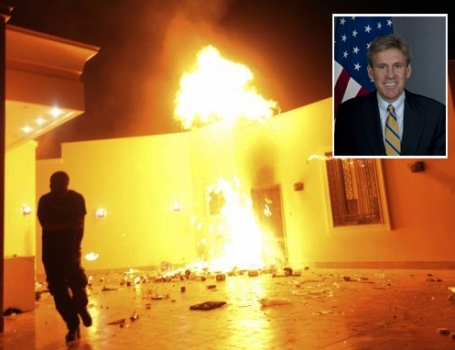 Ambassador to Libya Chris Stevens, were killed after gunmen set fire to the U.S. Consulate in Benghazi, Libya. The killing, which coincided with a protest outside the consulate compound, surrounded an inflammatory movie about Islam’s prophet Muhammad. The Wall Street Journal identifies the filmmaker as Sam Bacile (reportedly a pseudonym), an Israeli-American real estate developer living in California. In fear for his life, “Bacile” has reportedly gone into hiding. YouTube carried the movie, “Innocence Of Muslims” for a time, but after the protest decided to remove it. However, it does carry several movie trailers. Take a peek and you can tell it ranks extremely high on the “cheese” scale. So high that I refuse to give you the link here. The movie portrays Muhammed as a womanizer, child molester and ruthless killer. Other scenes show angry Muslims destroying Christian homes and a donkey who was anointed the first Muslim animal. Without a doubt, the protesters chanted “Allahu Akbar!” before setting the compound on fire and killing four people. But this begs the question: How big is Islam’s God if his followers must act on his behalf? I mean, if he’s that great, why does he need people to come to his defense? Can’t he defend himself? This begs another question: How big must Sam Bacile’s God be if he must act on his God’s behalf? A cheesy movie like that has a zero percent chance of winning people over from Islam. At a minimum, the movie is an attempt to strike a blow to the Muslim faith. Lest I cast a stone in my own glass house, I must ask myself, To what extent do I run to God’s defense? Sometimes, when I read comments from atheists belittling my faith—like I quoted in last week’s post—my initial reaction is to strike back. Back in New Testament times, the Jewish religious leaders were furious about an upstart sect that proclaimed Jesus was the messiah. So, in defense of their God, they jailed the entire leadership team of this sect, intent on putting them to death. Then a wise Pharisee named Gamaliel stood and addressed the incensed leaders. Extrabiblical records indicate that he was the most respected Jewish leader of his time (and the mentor of a young man named Saul, who we know today as the apostle Paul). Gamaliel’s words convinced the religious leaders, and they released them. Please understand, I’m not advocating a lackadaisical, fatalistic approach to life and faith. But in matters that involve a threat to the reputation of our God–If we really believe our God is all-powerful, then he doesn’t need us to fight his battles–except on our knees. What battles are you tempted to fight on behalf of God?